Week 3 of Last Dance on the Beach CAL is designed by Tatsiana from Lilla Bjorn Crocet, a great overlay crochet designer. 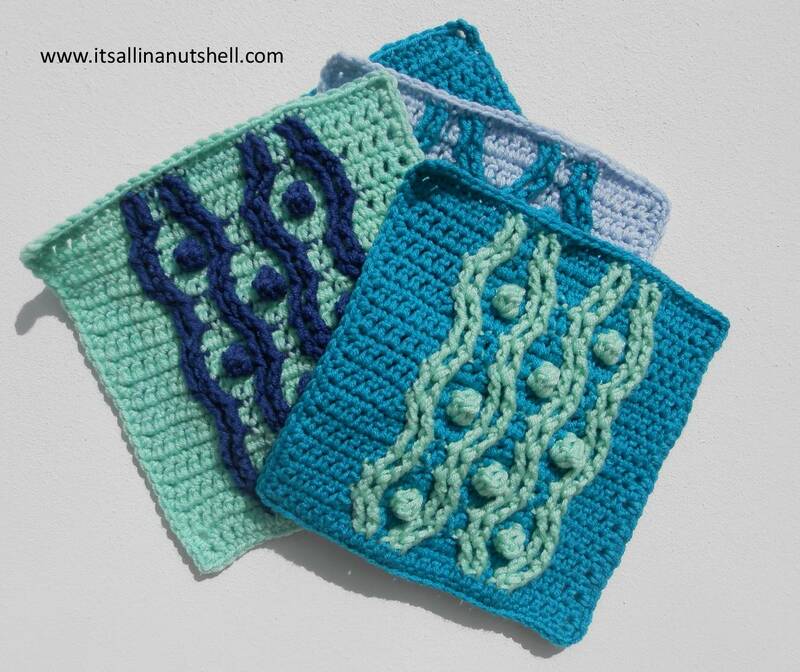 If you have never done overlay crochet before this weeks square might seem daunting at first sight, but once you get the hang of it it’s not that difficult. Just take in one step at a time and you’ll be fine. With her design Tatsiana looks back on her walk with Wink and her design for Last Dance on the Beach. The patterns on this square remind me of a rugged shore line with rocks and cliffs where the water can come and go with impressive force. As you most probably know by now I have two yarn kits, the Merino Soft Dancing in the Sea and the Color Crafter Dancing in the Sea. My Color Crafter blanket I am making using the colors specified in the pattern, but with the Merino Soft kit I am still playing with color. I have used a different color from the background to make the overlay more pronounced, actually overlay crochet is a technique that uses color to the fullest. On the other hand, making a square with just one or two colors really defines the texture of the design. This week I used a 4.5mm hook for my Merino Soft squares and a 4.0mm hook for my Color Crafter squares. This is the same hook I used for week 1 and my gauge swatch. For those of you that are left handed I have the video for week 3 available in English and Dutch. There are also available on the English and Dutch video pages. Again, please note that the English videos use UK crochet terminology. I hope to see you next week for part 4.